Beat the traffic and save money on gas, too. Here are 52 free and affordable things to do practically in your own backyard, many of which you can’t find anywhere else but right here in Union County. Step out of winter’s chill and take in a show at the fabulous Rahway Theater, our genuine 1920’s vaudeville palace which features one of the few fully restored Wurlitzer orchestra-style organs (as in, 500 pipes plus percussion!) in the entire region. The Rahway Theater is home to the non-profit Union County Performing Arts Center. All year long UCPAC hosts affordably priced shows featuring new rising stars and longtime favorites, including theater, music, dance, film, children’s shows, workshops and activities, the new UCACT community theatre series and the Sensory Friendly Theatre series, where each performance is a “judgement free zone” for everyone to enjoy. The theater is conveniently located in the heart of the downtown Rahway Arts District at 1601 Irving Street, just two blocks away from Hamilton Stage where you can find even more entertainments and activities hosted by UCPAC. Information: visit ucpac.org or call the box office, 732-499-8226. A crawl-through tunnel that lets youngsters cozy up to a tank full of turtles is just part of the interactive fun at Union County’s state-of-the-art Trailside Nature and Science Center. When the winter winds chase you indoors, Trailside offers many nooks and crannies to explore, and the soaring, spacious center hall lets you feel outdoorsy without freezing your feet. Cruise the exhibits, partake in one of many modestly priced special events and classes, or enjoy the free Wi-Fi (yes, free!) while you curl up in the warmth of our generously stocked reading room. Trailside also offers guided hikes and many other outdoor programs, all year ’round. Tracing its roots all the way back to 1941, Trailside is New Jersey’s very first natural history museum. It follows the National Park Service “trailside” model, aimed at helping residents to understand — and help to conserve — our natural surroundings. Trailside is located in the Watchung Reservation, at 452 New Providence Road in Mountainside. Admission is free every day (yes, free!). Visit Trailside online, email trailside@ucnj.org or call 908-789-3670. For something really rare and unique to Union County, make your way to a modest little building tucked away in a corner of our Lenape Park behind the Home Depot on Route 22 East in Union Township, and there you will find one of the largest displays of model railroads in all of North America. Built and run by the nonprofit organization The Model Railroad Club, Inc. under a special arrangement with Union County, this hidden gem is well known among aficionados for its meticulous attention to detail, and for its focus on historical features of the railways linking Pennsylvania and New Jersey. The display is open to visitors on most Saturday afternoons for a modest fee, and the Railroaders will be happy to show you around. 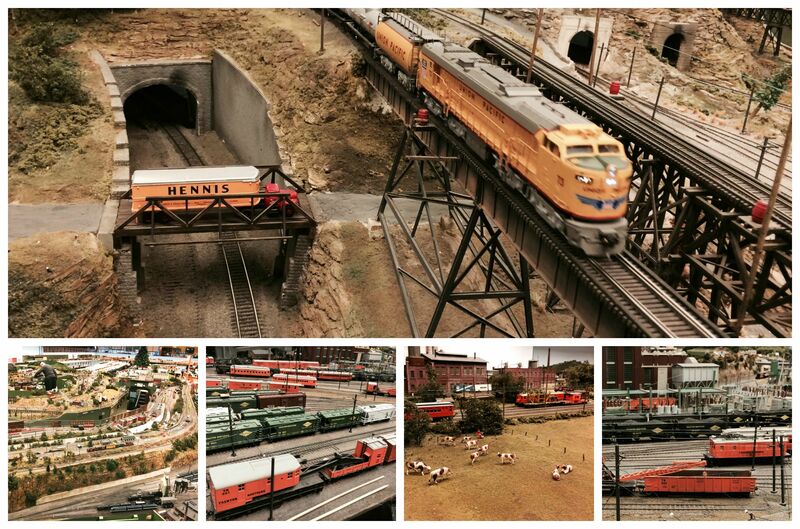 Stop by this year and you’ll get to see the engineering skills of the Railroaders in full display. A huge expansion is in the works, so across from the finished areas you can see all the “bones” of the new section before the final touches are layered on. Be sure to visit again right around Thanksgiving for the annual holiday-themed Light and Sound Show extravaganza. For visiting hours, Light and Sound Show tickets, and membership details: visit tmrci.org or call 908-964-9724 or 908-964-8808. 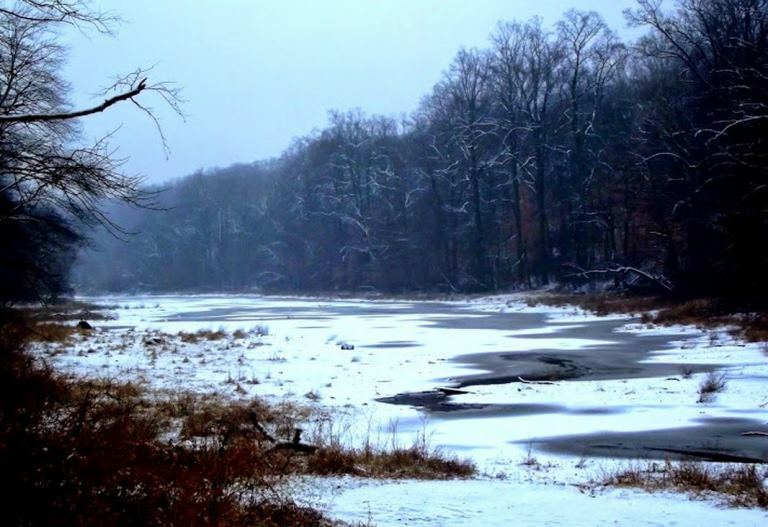 Lake Surprise in winter, Union County NJ (photo by Linda Brazaitis). Let your imagination run wild with a winter stroll through the treescape of our generous park system. Where some see gloom, others see romantic echoes of our wilderness past. Thanks to generations of preservation-minded residents, our parklands now account for more than eight percent of the land in Union County — a remarkable achievement in this densely developed region. For dog lovers: Let your best friend off the leash at our Dog Park, located in Echo Lake Park. This expansive, enclosed area features a section set aside for smaller dogs. Echo Lake Park stretches from Mountainside to Springfield just south of Route 22 (follow Park Drive and look for the Dog Park signs). 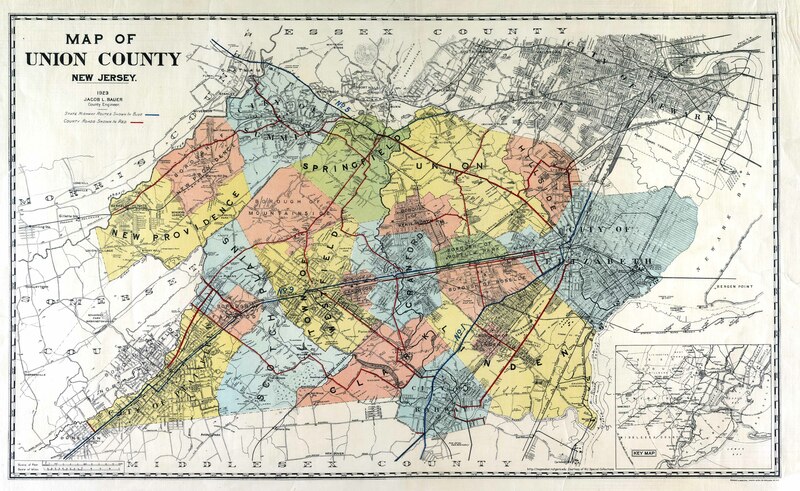 For a complete list of Union County parks, including maps and directions, visit ucnj.org/parks. When certain members of the family start bouncing off the walls, bundle them up and take them on a walk through the woods. You can hike all day on the miles of trails in the Watchung Reservation, or hook up with our expert naturalists at the Trailside Nature & Science Center for guided walks and other outdoor fun including movies and campfires. 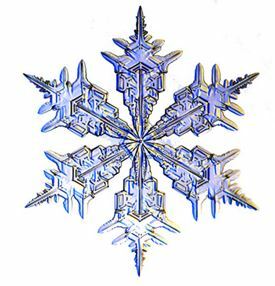 For list of indoor and outdoor winter programs at Trailside for children, visit Trailside online, email trailside@ucnj.org or call 908-789-3670. Warinanco Sports Center Union County NJ. The new Warinanco Sports Center is iced up and ready for skaters all season long include open skating, group rentals, lessons, hockey clinics, the annual George T. Cron high school hockey tournament, popular seasonal events, programs for people with disabilities, and much more. Not just for skating any more: the new upgrade enables the facility to be used all year ’round for public events and activities, and private parties and events, too. It features a spacious, modern lounge, dining, and free Wi-Fi, too. The Sports Center is located in Warinanco Park on One Park Drive, in Roselle. 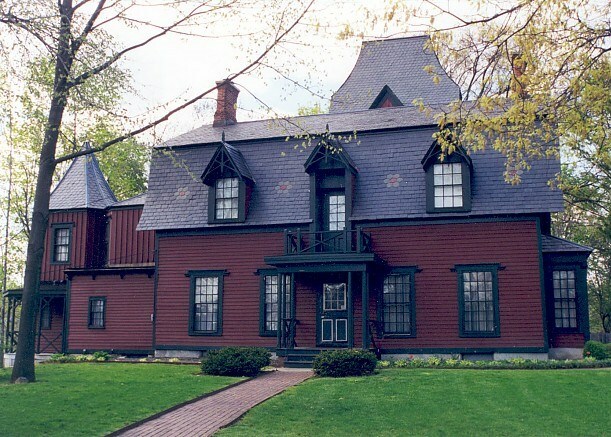 For more information and activity schedules visit warinancopark.com. Please note: outdoor skating on County lakes is subject to ice conditions and is permitted only where posted. Artist rendering of new Warinanco Sports Center. The scene at Echo Lake Park after a big snowfall. 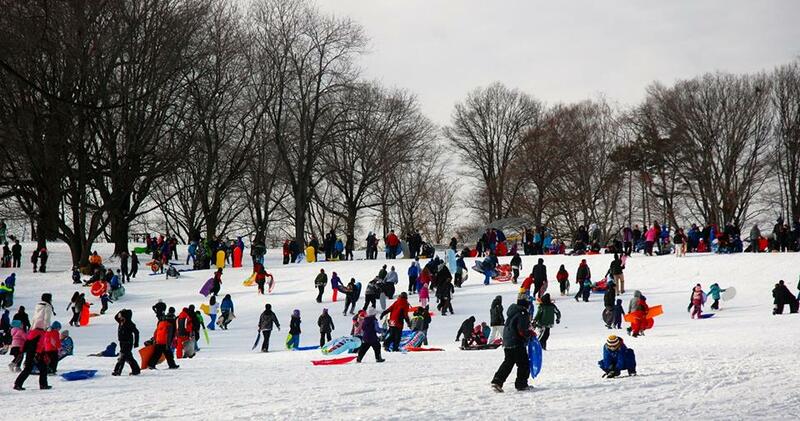 Called “one of the best sledding parks in the area” by Patch.com, Echo Lake Park has been a winter tradition for generations of Union County residents. Echo Lake Park is conveniently located just south of Route 22 in Mountainside. The most popular slope is by the east end of the park near the Springfield border (photo by Jim Lowney/County of Union). For a list of permitted sledding areas in Union County parks use the searchable activities page at ucnj.org/parks. For nonstop cross-country skiing, you can glide all day along the trails in the sprawling Watchung Reservation. Get out early enough and you could be the first to experience something truly unique and exhilarating: breaking through inches of fresh, untouched powder! Cross-country skiing is also permitted at several other County parks. 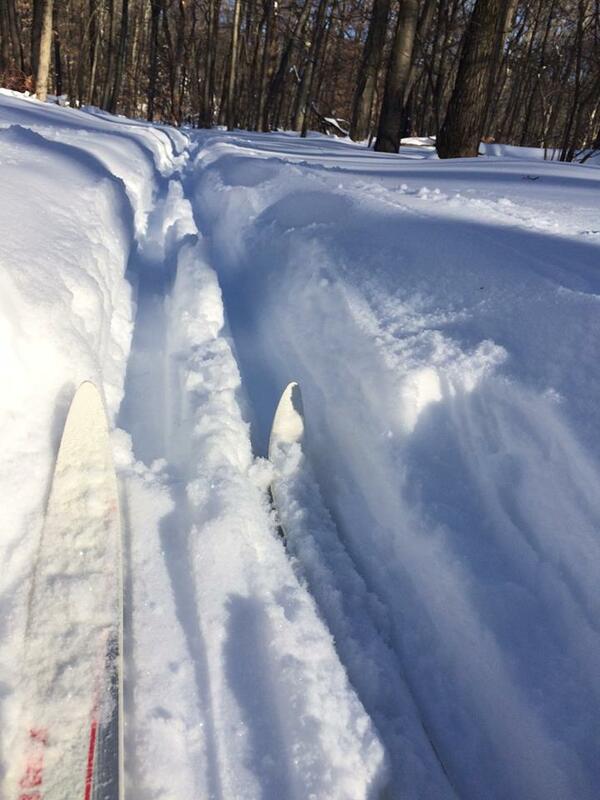 For a list of permitted skiing areas in Union County parks, use the searchable activities page at ucnj.org/parks. Please note, downhill skiing is prohibited on all County property. 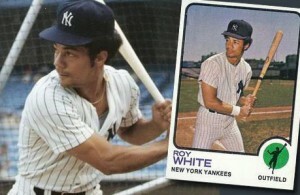 Roy White, former Yankee All-Star and coach. The timing is right for Valentine’s Day, so treat that special someone to a truly unique gift — tickets to the annual Hot Stove League Baseball Dinner. Each February, the Union County Baseball Association hosts this annual fundraiser. Get your tix early and get ready for an exciting evening of food, fun, and baseball. 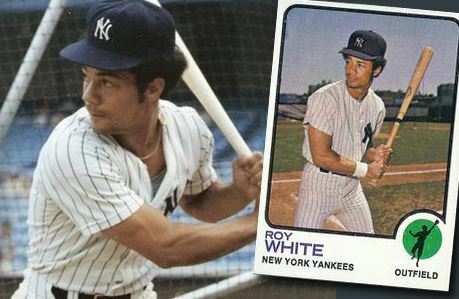 The fundraiser celebrates top players in the countywide youth baseball league, and it often features fan favorite guest speakers from the big leagues. Speaking of unique, along with summer leagues for younger players, UCBA also hosts a fall season league for teens played exclusively with wooden bats. Where else can you still play organized youth baseball with wooden bats? Union County is proud to help support UCBA, which has provided our youngsters with lifelong baseball memories since the 1930’s. For more information visit ucba-nj.org. Washington-Rochambeau Trail (courtesy of National Park Service). Meet the newest “trail” in the Union County Parks System: our own section of the National Parks Service’s new Washington-Rochambeau Historic Trail. The trail commemorates the 680 miles traveled by the combined armies of George Washington and France’s Jean Baptiste de Vimeur, comte de Rochambeau in 1781, ending in victory at Yorktown.In 2014 Union County became the first county in New Jersey to mark our section of the route with commemorative signs. When the sidewalks are clear of ice and snow you can retrace the steps of those 18th century heroes, following the signs along Raritan Road and Lamberts Mill Road in Scotch Plains, West Broad Street and Mountain Avenue in Westfield, Mountainside and Springfield, Morris Avenue in Springfield, and Morris Turnpike in Summit. 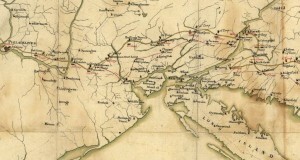 For maps and directions visit ucnj.org. You can spot the first signs of spring throughout Union County’s 36 parks. Look closely among last year’s fallen leaves for colorful reminders that the warm season is approaching. If the woodland trails are still muddied by spring rains, take a stroll along the many paved paths at our parks. In Warinanco Park, you can enjoy a riot of blooms at the Azalea Garden later in the spring, view the subtle blossoms of native flowering plants along the shores of Warinanco Lake, and check on the progress of our new perennial plantings at the classically styled Chatfield Garden. Help us preserve our fragile woodland flora by staying on the marked trails and paths. For a complete list and maps of Union County trails, paths, and greenways visit ucnj.org. Union County is located on the Atlantic Flyway and our parks system is dotted with lakes, ponds, and other features attractive to scores of bird species. Our Lenape Park, for example, is “a critical habitat for over 190 species of birds including many migrant songbirds from South and Central America” according to the U.S. Geological Survey. 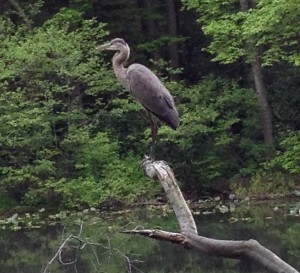 A stately heron graces the waters of Lake Surprise. When it’s too cold for bird watching outside come inside to the Trailside Nature and Science Center, where you can watch the action around strategically placed bird feeders from the comfort of a picture window. You can also spot some amazing birds from the comfort of your own computer, tablet or smart phone. 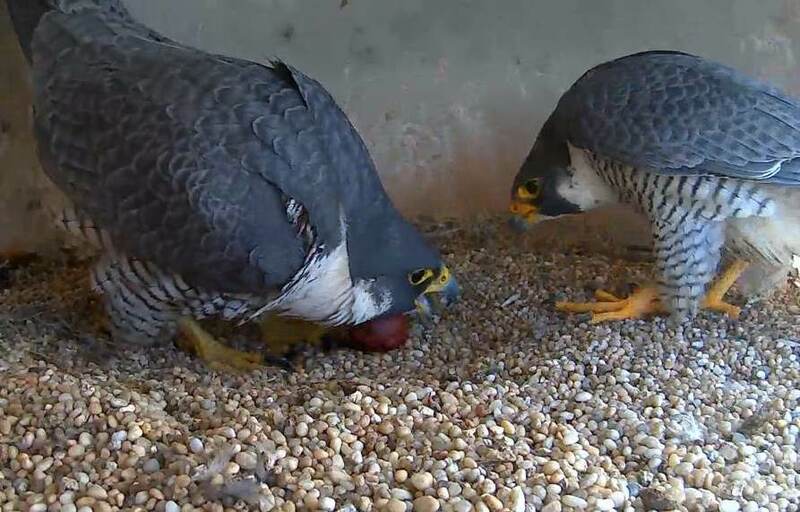 Each spring, Union County’s very own pair of peregrine falcons bustle about their home in a permanent nest high atop the historic Union County Courthouse in midtown Elizabeth, and our free Falcon Cam livestream catches all the action. Peregrine falcons all but disappeared from our region in the 20th century, until conservationists stepped in to help restore the population. Union County is proud to partner with the NJ Division of Fish and Wildlife and the Conserve Wild Life Foundation on efforts to protect and preserve this fierce and fascinating creature. More info + free livestream: ucnj.org/falcon. Read our birding reports and join a birdwalk, too. Bird reports and contact info: ucnj.org/parks-recreation/wildlife-management. You can find a stable full of friendly horses at Union County’s Watchung Stable in Mountainside. We offer lessons, camps, Scout activities, birthday parties, and special riding events for children and adults including guided trail rides through the peaceful woods of the Watchung Reservation. Non-riders and visitors are always welcome to stop by and say hello. Exciting news for 2016: Watchung Stable is slated for a major renovation and expansion this year, including our first-ever indoor rink. Normal operations will continue while the work is under way. Watchung Stable is located at at 1160 Summit Lane in Mountainside. 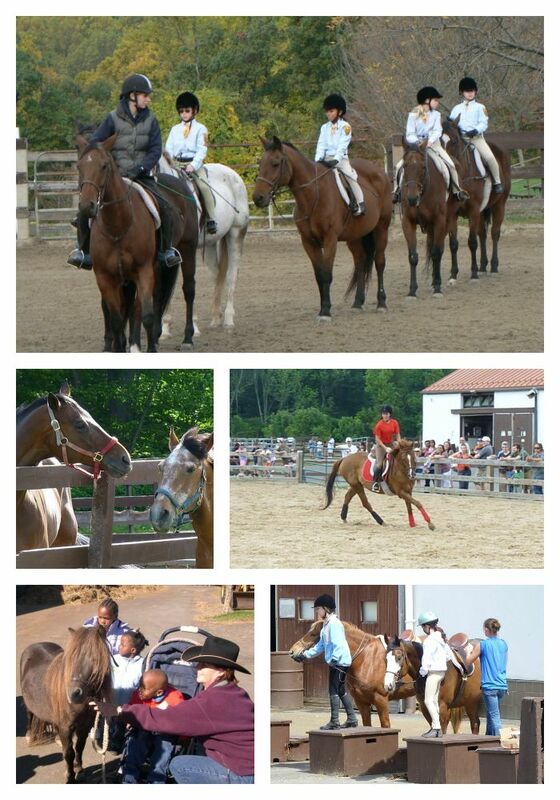 More information on the stable and Troop Shows: visit ucnj.org, email stablequestions@ucnj.org or call 908-789-3665. Our many spring-flowering trees make a perfect backdrop for that special photo of that special someone. 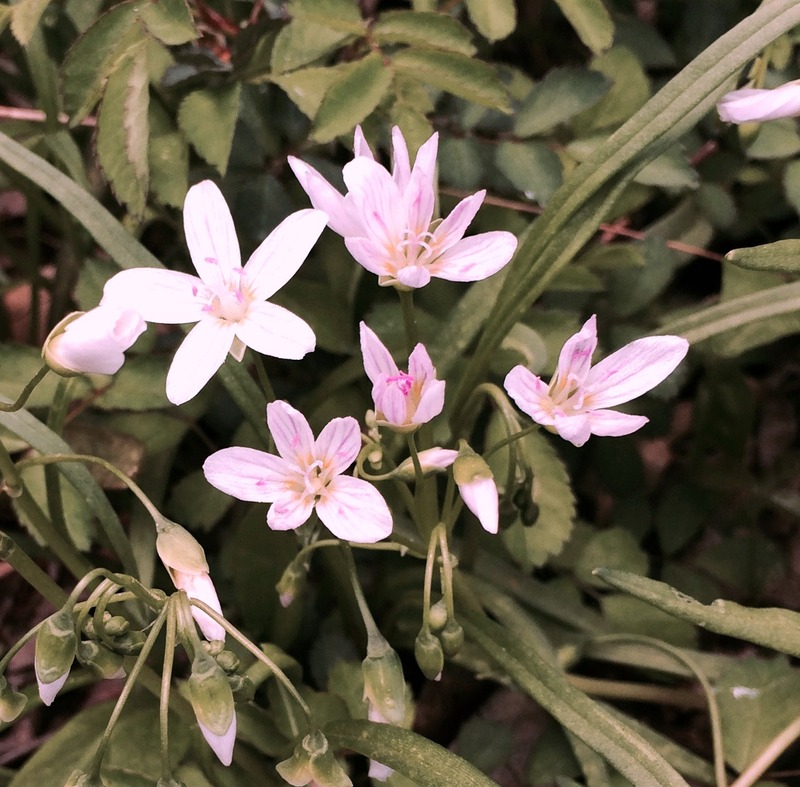 You can find a plethora of blossoms every spring at Nomahegan Park and throughout our County parks system. 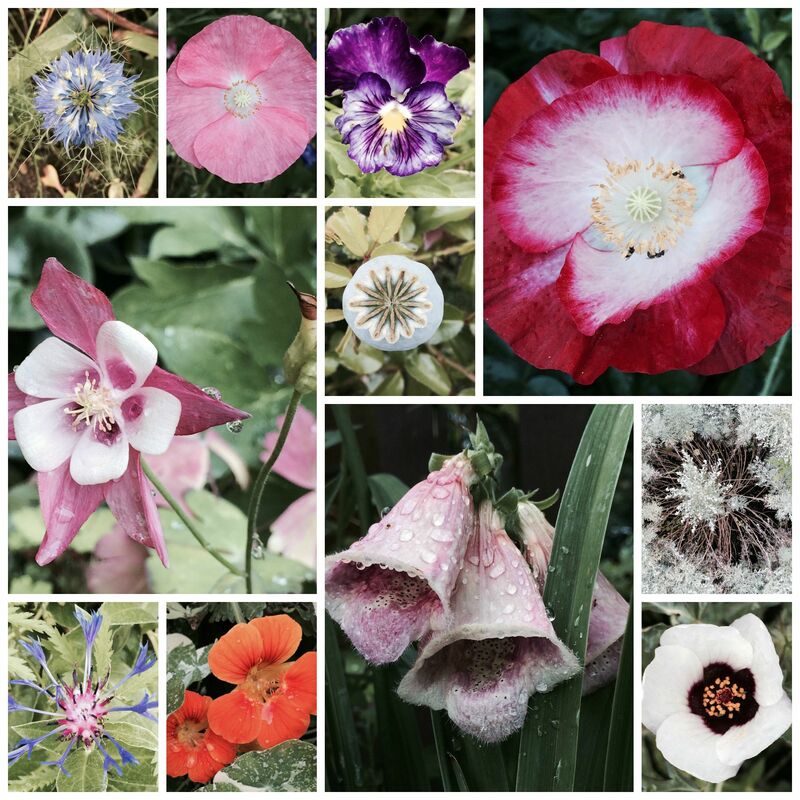 Check out the Azalea Garden in Warinanco Park for another gorgeous display of spring colors, and look for early bloomers at our Shakespeare Garden in Cedar Brook Park. The newly restored gazebo by the dam at Echo Lake Park is another favorite place for informal portraits, or simply taking in the peace and quiet of a beautiful rustic scene. Alongside the gazebo is a one-of-a-kind handcrafted water wheel, generously donated to the residents of Union County by Barbara Levinson of Mountainside in memory of her husband Dr. Joel Levinson and their son, Kipp. 15 Find a zen moment. Here’s another unusual “trail” you can explore in Union County: the path to deep relaxation, under the guidance of a trained yoga instructor at our Trailside Nature & Science Center. Our Trailside yoga classes are for teens and young adults with special needs, part of a growing roster of programs that include all Union County residents. You can find inclusive programs at other Union County facilities including the Warinanco Ice Skating Center and our swimming pools, too. For more information on other County recreation opportunities for people with disabilities and special needs, visit the new Office for People with Special Needs online or call 908-527-4781. 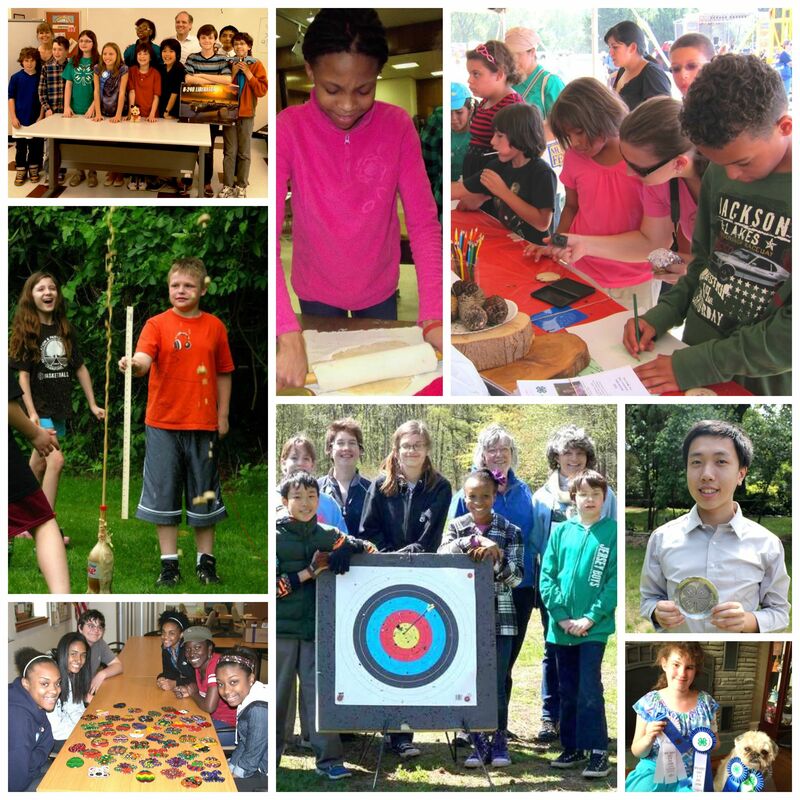 For more information about all programs and activities at Trailside, visit online, email trailside@ucnj.org or call 908-789-3670. If you are yearning for the days of the good old fashioned fishing derby, yearn no more. Just come on down to the Lower Lake at Echo Lake Park and join in the fun. The 2015 Kids Fishing Derby hosted by the Newark Bait and Fly Casting Club derby is slotted for three weeks in a row at Echo Lake Park starting in April. Kids 16 and under are free, and make sure to register at the Gazebo at Echo Lake (see #13 above) to receive a gift bag. Grownups can also enter the derby for a nominal fee (sorry, no gift bag for the grownups). Prizes will be announced at the Club’s meeting in June. For more information, visit nbfcc.com or email info@nbfcc.org. 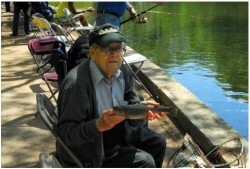 Fishing events for all ages at Union County parks. Also each year at the Lower Lake, members of the East Central District Elks host the all-ages Spring Fishing Derby designed especially for persons with disabilities. As always, the Elks are load up the fun with contests, prizes and a hot dog lunch. For more information about the Elks Fishing Derby and other Union County recreation opportunities for persons with disabilities, visit ucnj.org/parks-recreation. Of course, non-derby fishing is also permitted in Echo Lake and many other Union County parks. Visit ucnj.org for a complete list of available sites (state fishing license not required for persons under 16 or over 70). Ever wonder what Picasso was up to in 7th grade? You can get a glimpse into the mind of a young artist each spring at the Teen Arts Festival. The two-day event takes place in March at the Cranford campus of Union County College. More than 4,000 middle and high school students participate along with a staff of professional artists. The public is invited to peruse the exhibits, soak up the inspirational atmosphere, and enjoy the artistic talents of our young Union County residents in the visual arts, music, writing, theater, media arts, and dance. For a schedule and more information call the Union County Office of Cultural and Heritage Affairs at 908-558-2550, or visit ucnj.org. 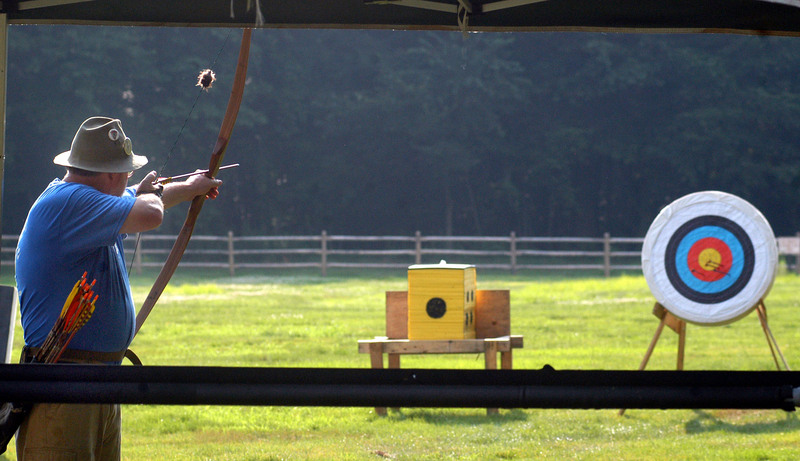 The Union County Archery Range at Oak Ridge Park in Clark is the only outdoor public facility of its kind in the entire region, providing a unique chance to hone your skills in this ancient art. If you’ve never bent a bow before, no problem. We offer safety courses for beginners age nine and older. Our experts will provide you with equipment and show you how to use the range. Our Olympic scale outdoor range was built with the generous assistance of volunteers in the archery community. Open seven days a week from dawn to dusk, it is fully accessible for persons using wheelchairs. You can get a permit to use it all year for a modest fee, and by passing the aforementioned safety course or providing other documentation of archery experience. 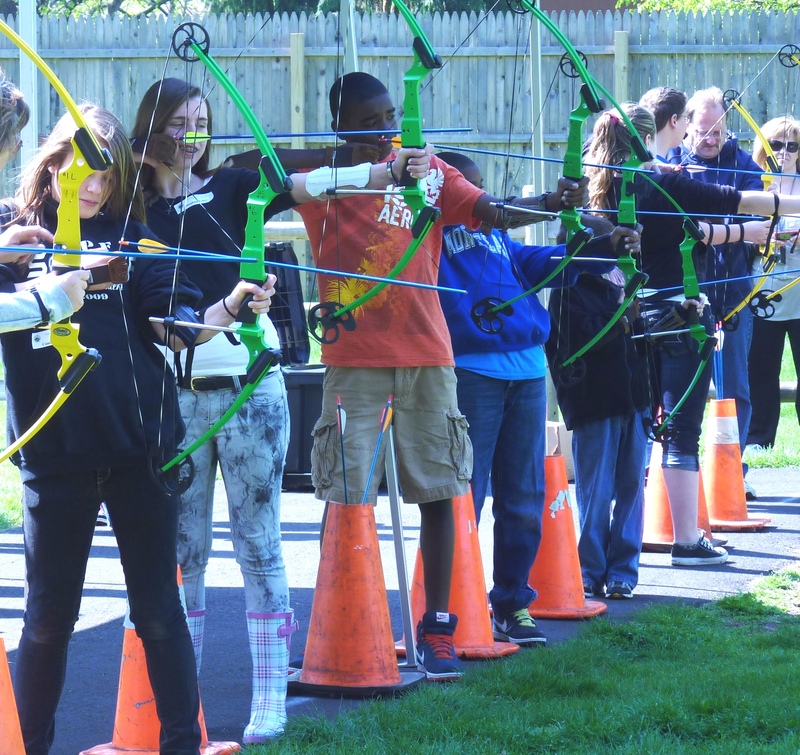 For more information about getting an archery permit visit ucnj.org or call our Parks Department, 908-527-4900. 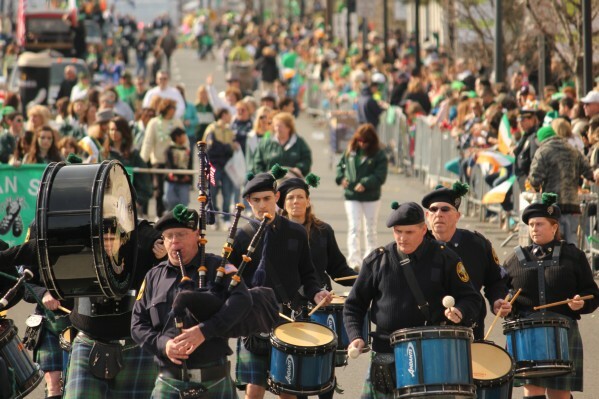 Union County has one of the biggest St. Patrick’s Day celebrations in New Jersey. Centered in Union Township, the festivities include a huge parade complete with bagpipes, drums, high school marching bands, local police and fire department units, veterans groups and many other organizations, floats and all the trimmings as well as dancers, music and stage performances, children’s activities and more. For more information visit the folks at unioncountystpatricksdayparade.com. 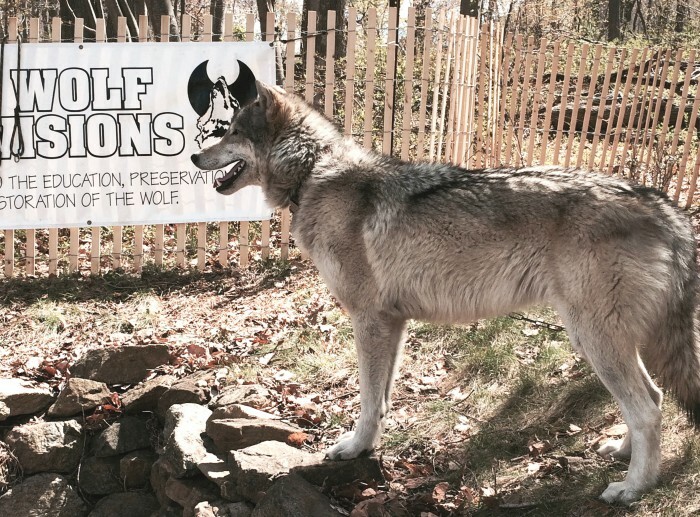 This friendly wolf is a regular visitor to Wild Earth Fest. 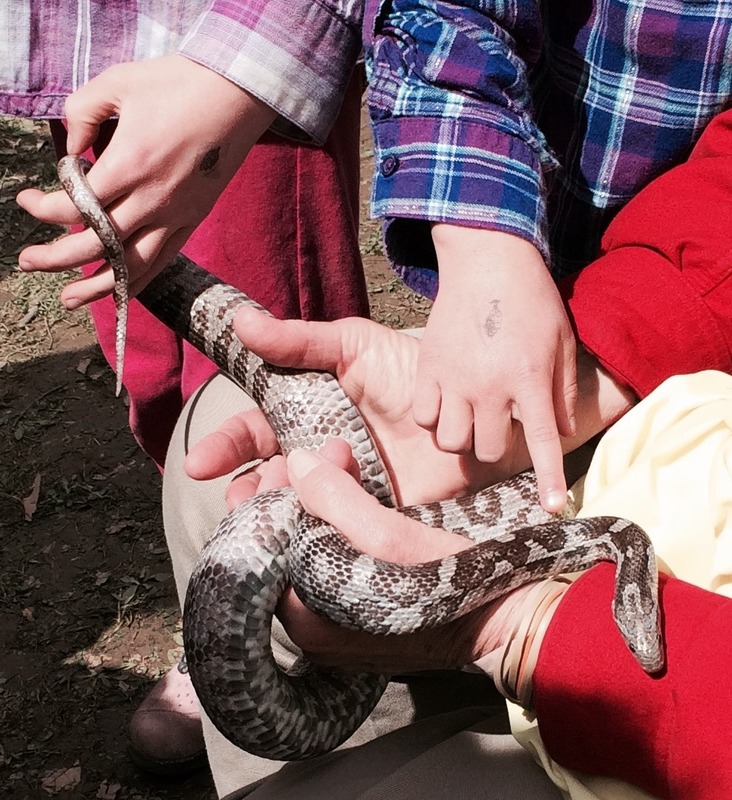 Kids can meet snakes, turtles, and other animals at Wild Earth Fest. If wild animals are your cup of tea, come to the Wild Earth Festival at the Trailside Nature & Science Center in Mountainside. This family-friendly event is held every spring and it is packed with activities: live animal demonstrations, children’s crafts, music, eco-art, the “Recycling Olympics,” nature crafts for sale, and more. You can also sign up in advance to enter into the Wildlife Photography Contest and the Environmental Hero Awards (for more on those information call Trailside at 908-789-3670). To round out the day, come inside and explore Trailside, and don’t forget to stop by the “Touch a Truck” event — it’s free with your admission to Wild Earth Fest. Right near the Wild Earth Festival you’ll find Union County’s own version of “Touch a Truck,” where kids can climb all over their favorites: fire trucks, emergency vehicles, construction trucks, and more. It’s a perfect chance to snap a great family photo. 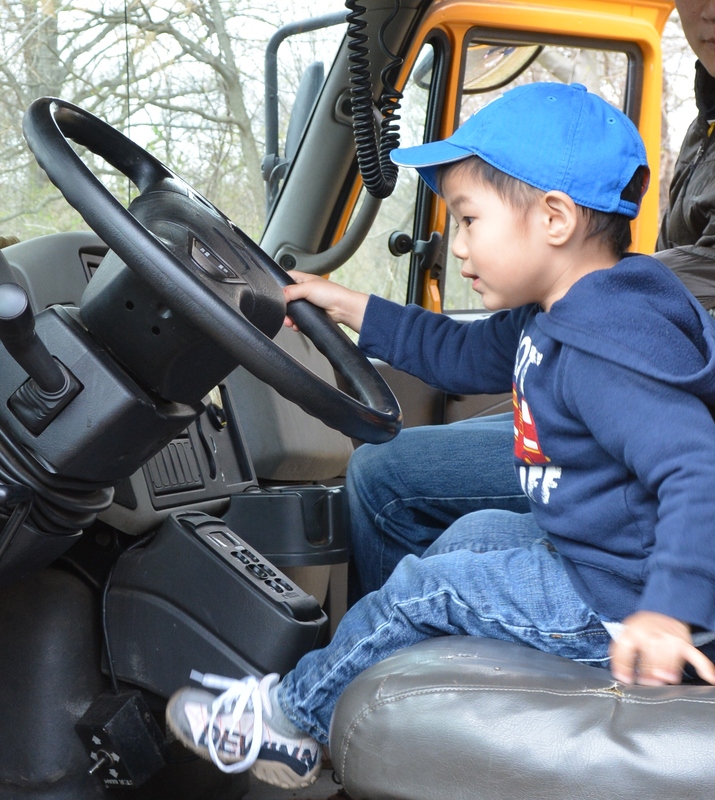 The same modest admission fee gets you into both Touch a Truck and Wild Earth Fest. You can keep the fun going by picnicking at Union County’s biggest playground in the Loop just across the way. 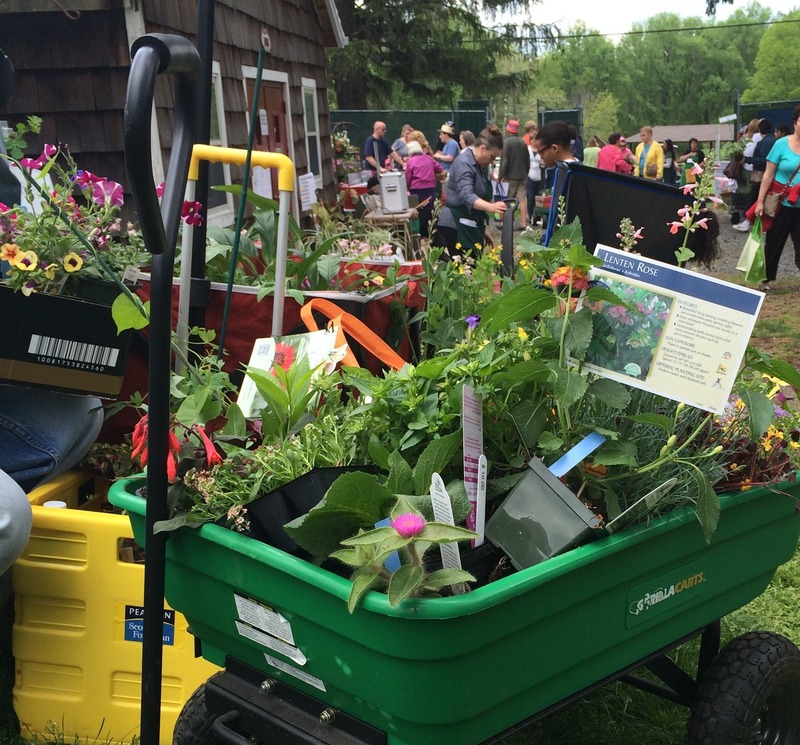 Gardening enthusiasts gather at the Watchung Reservation each May for the Spring Garden Fair and Plant Sale, featuring hundreds of flowering plants, herbs and vegetable seedlings for sale highlighted by the famous Ramapo Tomato. Bring the kids for a fun afternoon, including children’s activities, gardening info, garden crafts, gently used books and tools, and baked goodies for sale. Union County experts are on hand to share free gardening information and advice, and you can also get a tour of the new greenhouse and elaborate Demonstration Gardens, tended by the Master Gardeners of Union County. The Master Gardeners of Union County are the brains, hands, and hearts behind the fair. All of the proceeds go to fund the volunteer group’s many community projects and a horticultural scholarship. 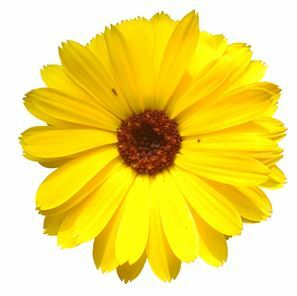 For Garden Fair information – or better yet, to learn about joining the Master Gardeners – call the Union County Extension, 908-654-9584 (press “4”) or visit the Extension online at ucnj.org/rce. The Master Gardeners program is run by the Rutgers Cooperative Extension of Union County with the support of the Union County Board of Chosen Freeholders. The boat ramp at Lake Surprise in the Watchung Reservation makes it easy to launch a kayak, rowboat or canoe, and you can spend hours paddling the mile-long lake. Keep an eye out for ducks, turtles, and even a heron or two. It’s just one of several waterways in Union County parks designated for boating. Pedal boating at Echo Lake Park. 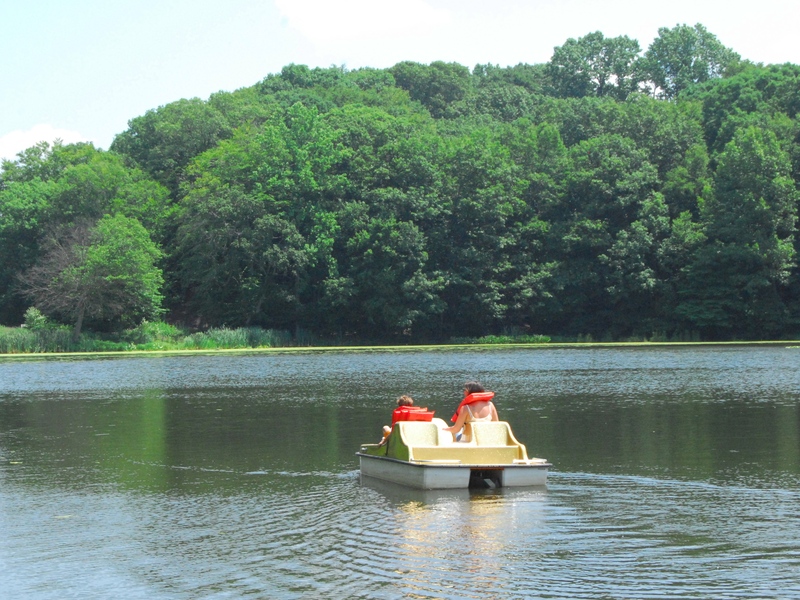 Before you take to the water, call the Department of Parks and Recreation at 908-527-4900 for information on filing the required Union County Boat Permit. Union County also has two parks that feature the time-honored summertime tradition of pedal boating, Warinanco Park and Echo Lake Park. For information on the pedal boat concessions visit ucnj.org or call 908-527-4900. What could be a greater thing to do than helping to save the planet? 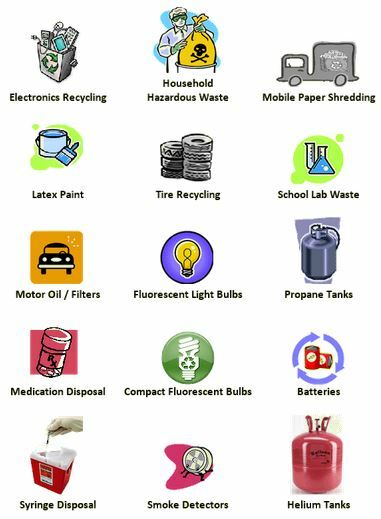 Union County has been at the forefront of the recycling movement, and our free seasonal countywide recycling events are among our most popular programs. Every year, from spring through fall, you can bring your personal papers to our secure paper shredding events and safely dispose of household hazardous wastes. We also coordinate free drop-off locations for all kinds of scrap metal, and for those long, tube-style fluorescent light bulbs. For many more details — and a recycling directory for businesses — visit online at ucnj.org/recycling. 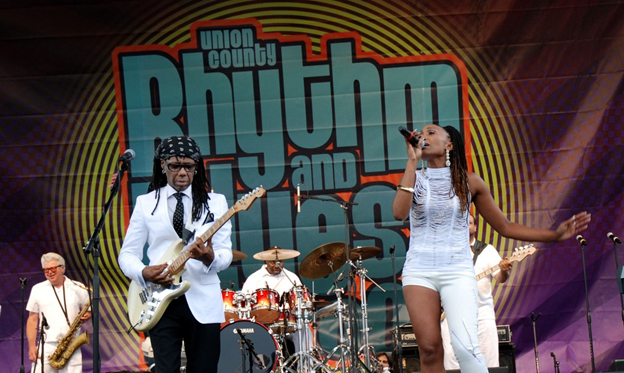 Nile Rogers and Chic headlined Rhythm and Blues by the Brook in 2011. As spring winds down, Union County starts to gear up for a great summer of free outdoor music and movies. Get a jump on the season with Rhythm and Blues by the Brook, our day-long music festival at Cedar Brook Park in Plainfield. It’s back on our calendar after a hiatus of several years, so join us to kick back and enjoy some great sounds in the relaxed atmosphere of Cedar Brook Park. 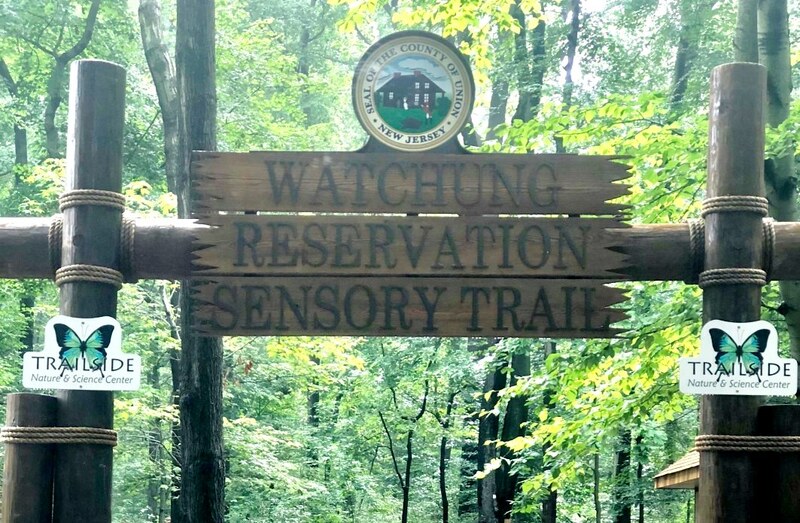 The new Watchung Reservation Sensory Trail opened in 2018. It is the first of its kind in the county and the most extensive one in the nation. The trail is accessible to all visitors, seven days a week from dawn to dusk. It is located behind the Trailside Nature and Science Center at the Watchung Reservation in Mountainside. The 0.3 mile loop stretches into the surrounding fields and features a central gazebo with a nature themed play area, talking kiosks, outdoor classrooms, interactive musical components, raised garden beds and a 0.2 mile braille trail loop with guide ropes and educational features. 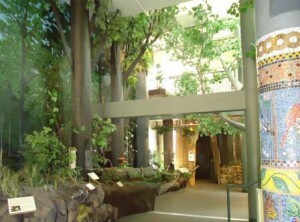 For more information visit the Trailside Nature and Science Center online. Soaking up the sun at Ulrich Pool in Rahway River Park. 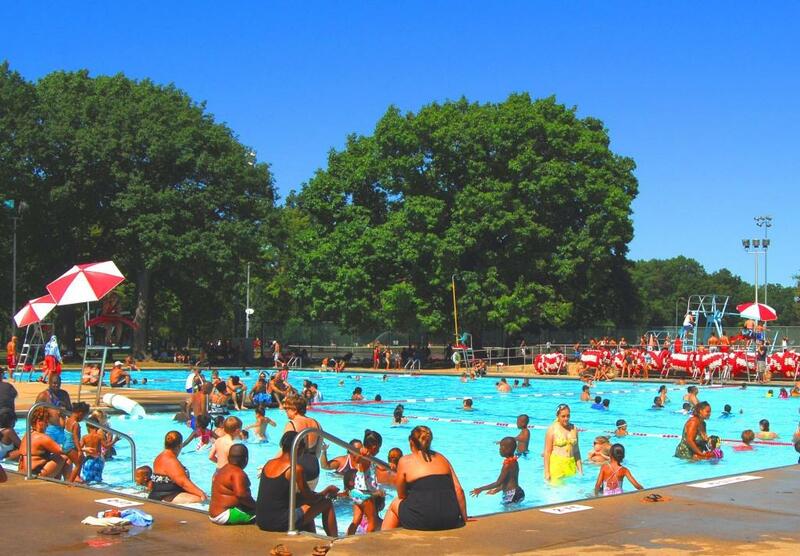 With the Walter E. Ulrich Memorial Pool in Rahway River Park open to all County residents and visitors, you can spend countless hours in the sun without fighting Shore traffic. Swimming lessons are available for adult and little swimmers for a nominal registration fee, and there are programs for persons with disabilities, too. While you’re lounging poolside, check out the free (yes, free!) Wi-Fi . For information about the Walter E. Ulrich Memorial Pool — and to inquire about Lifeguard positions — call 908-732-4045 or visit the Pools page at ucnj.org. The Ulrich Pool opens for the season on or about the end of the school year, and closes at the end of August. Partof the new playground/sprayground at Warinanco Park (photo by James Lowney/County of Union). Speaking of water fun, new “spraygrounds” are popping up like mushrooms all over Union County parks. Our latest spray-play project is in the all-new playground at Warinanco Park, which just completed construction in spring 2015. With more than 100 jets of water, there is plenty of action to keep the wet set busy all day. As with our County swimming pools, our spraygrounds are generally turned on around the end of the school year, and stay on until the end of August. For a list of County playgrounds equipped with spray features visit the searchable Parks Activities page or call the Parks Department, 908-527-4900. The B Street Band rocked Veterans Appreciation Night at Union County’s free Summer Arts concert in August 2012. Union County’s generous tree canopy can be tough on aerial recreation, but if you want to send your kite aloft with minimal interference from our leafy friends, take a trip to our Oak Ridge Park in Clark. Once a golf course, Oak Ridge still shows its golfing roots with amazing vistas of open space and just a smattering of trees in between. Oak Ridge also hosts of our Summer Arts series of free outdoor concerts each July and August. The Summer Arts series also travels to other County parks throughout the summer, so download a fridge-friendly calendar to keep track of the dates and locations. For a rundown on all activities in County parks, visit our Parks Activities page. 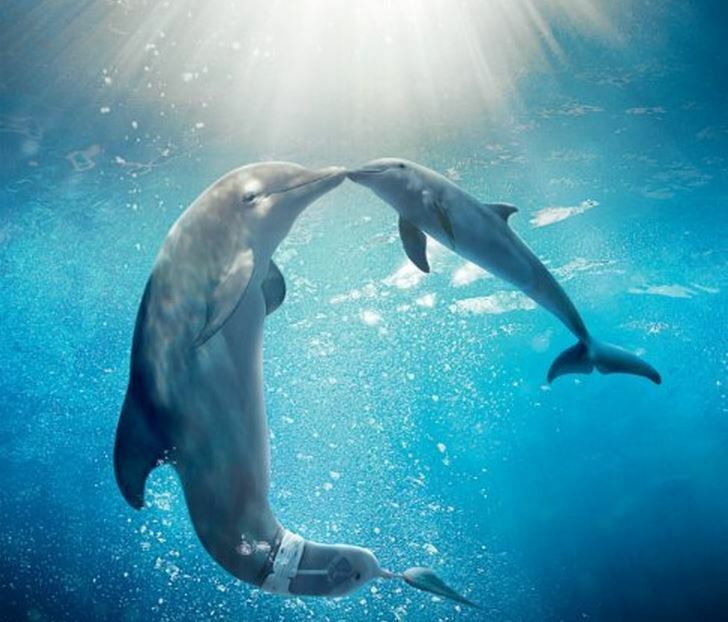 Dolphin Tale 2 was part of the 2015 Family Flix lineup. What could beat a free outdoor movie? How about a free outdoor movie with yoga for kids! Catch our Family Flix series of free kids’ movies on Tuesday nights and join in a free session of gentle stretching and relaxation, especially designed for kids. Yoga starts at 7:30 p.m. and the movies start at dusk. Download a fridge calendar to keep track of the action as the Family Flix schedule takes you from Warinanco Park in Roselle to Meisel Park in Springfield, and back again. 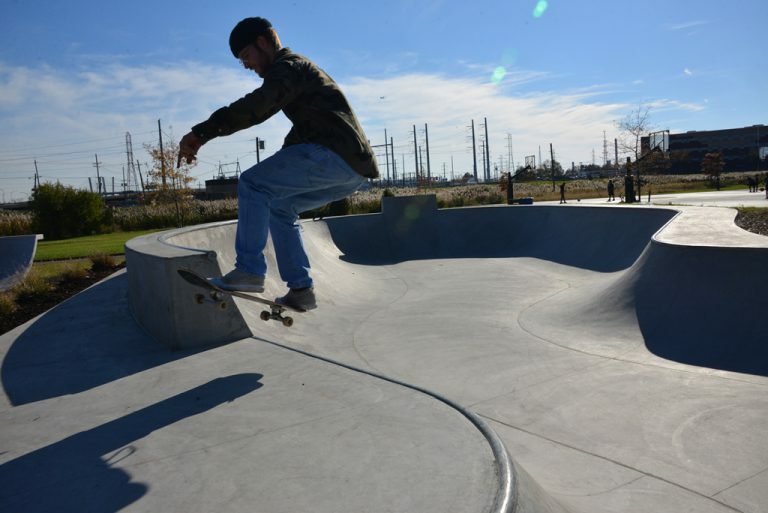 Union County opened another new skate park in 2018. This one is located in Mattano Park at 360-484 5th Avenue in the southern corner of Elizabeth. 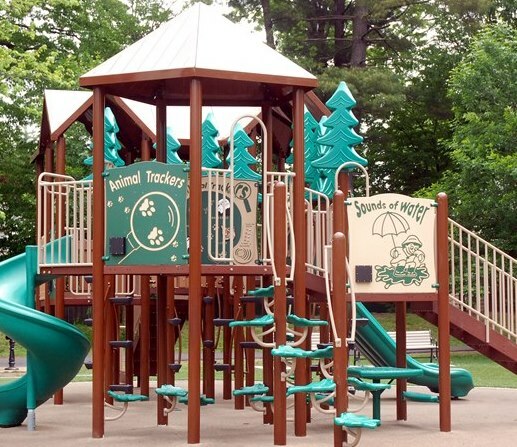 Mattano has something for everyone from all walks of life, including a sprayground and a fully accessible playground for children with special needs. 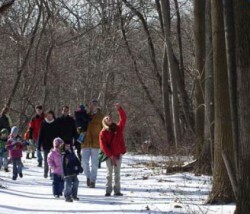 For a park-by-park list of all activities in Union County parks visit ucnj.org/parks. Cedar Brook Park is home to one of the finest examples of an early 20th century Shakespeare Garden in the entire country. Stop by with a picnic lunch on a sunny summer afternoon when the Shakespeare Garden is in full bloom, and enjoy this meticulously organized riot of color at your leisure. The garden is open to the public from dawn to dusk every day. The Plainfield Garden Club partnered with the Union County Parks Commission to install the garden almost 100 years ago, in 1927. Members of the Garden Club have tended it beautifully ever since. Union County’s two public golf courses combine the quality of private clubs with affordable fees and a welcoming atmosphere for all, under the management of the renowned firm KemperSports. 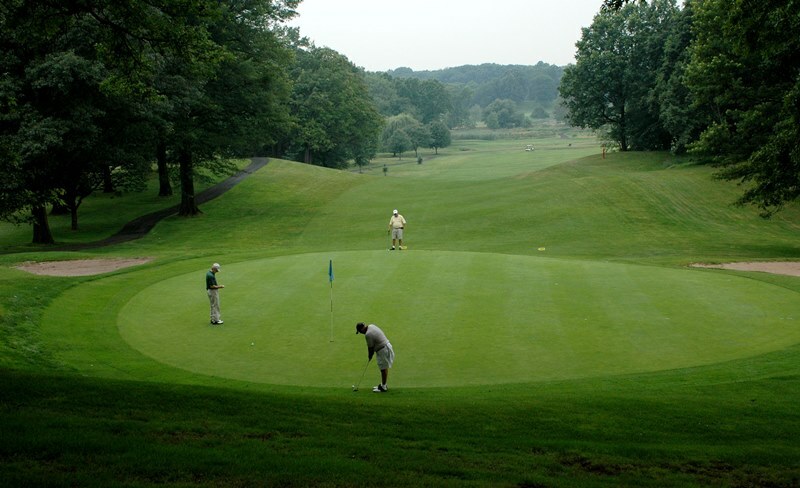 Our Ash Brook Golf Course in Scotch Plains offers a relaxed parkland style 18-hole course with Pitch & Putt. A recent overhaul of our Galloping Hill golf Course in Kenilworth includes a new club facility and banquet hall that serves as the new headquarters of the New Jersey State Golf Association, and the highly regarded Red Knot gastro pub. “The Hill” welcomes all skill levels and ages with one of the most challenging 18-hole courses in the area, a practice course, all-weather driving range, PGA-certified instructors, the Learning Center with First Tee youth programs, and a TaylorMade Performance Lab. What could be a better thing to do than to help conserve our natural heritage? Hundreds of volunteers help to keep our Union County parks pleasant and enjoyable every year. They also work on habitat conservation projects like pollinator gardens and shoreline restoration. Whether joining an afternoon cleanup to mark Earth Day or making a longer commitment, all are welcome: individuals, Scouts and other youth groups, school groups, civic groups and employer/employee groups. For more information about Adopt-a-Park and its sister program Adopt-a-Trail, call 908-789-3683or visit ucnj.org/parks. 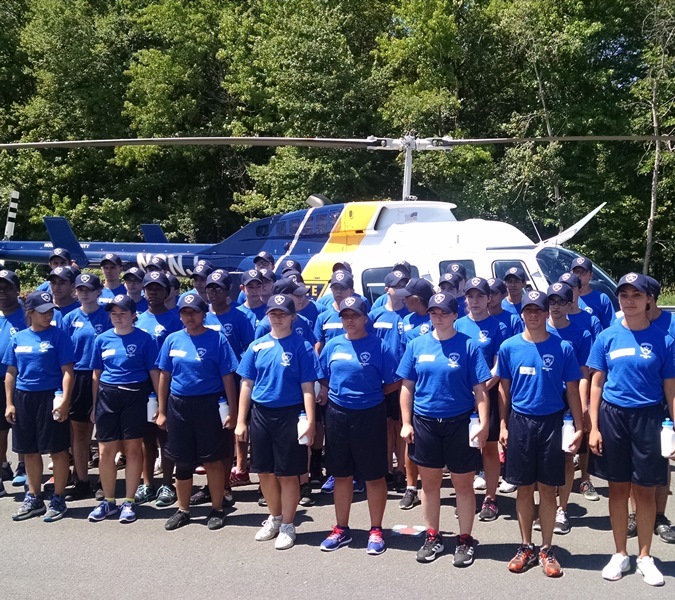 If you’re interested in a career in law enforcement, get a head start with The Union County Sheriff’s Youth Academy, a unique summer camp for middle school and high school students. The one-week camp takes place at the John H. Stamler Police Academy in Scotch Plains. It features physical training, hands on learning, and demonstrations from specialized units such as the SWAT Team, K-9, Federal Agencies and the State Police Aviation Unit. This is a free program — yes free — offered by the Union County Sheriff, to help provide young people with insights into they daily operation of law enforcement and emergency services in Union County. Participants only need to pack a lunch, buy a pair of khaki trousers, and arrange for their own transportation. Keep your grades up during the school year to qualify — a GPA of 2.7 and a personal reference are required to attend. Tucked away from the hustle and bustle of city life lies The Deserted Village of Feltville, a town rich in history but void of many people. Established in 1845 by businessman David Felt as a planned community for workers in his paper mill, the village nestled inside Watchung Reservation wasted away after its sale in 1860. Purchased in the 1920’s by the Union County Parks Commission, Feltville has been the subject of on-going restoration efforts including a complete makeover of its huge former carriage house, Masker’s Barn. Keep an eye out for our special events or come any time for a self-guided walking tour and wander through town down the main road. The visitor’s center — formerly the community’s church and general store — includes historic exhibits and is generally open on weekends. For information about booking Masker’s Barn for private parties, weddings, and events call the Parks Department, 908-527-4900 or visit online. 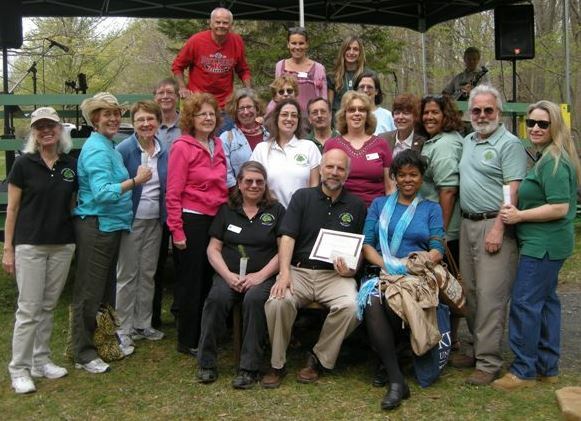 Union County Master Tree Stewards celebrate their “Environmental Hero” award with friends at the Trailside Nature & Science Center in Mountainside. The Master Tree Stewards of Union County are volunteers whose wonderful influence is felt throughout our neighborhoods. 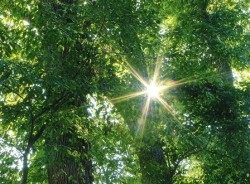 Their mission is to help us appreciate and conserve our valuable urban and suburban treescapes. No previous tree experience is needed — anyone can join! A certification course begins each September, consisting mainly of guided walks through nearby nature preserves. The centerpiece of the Master Tree Stewards’ efforts is a countywide “tree blitz” each spring, when they fan out to provide hundreds of 4th-grade students with a classroom lesson on the importance of trees in our environment. As with trees, no previous experience with children is necessary. 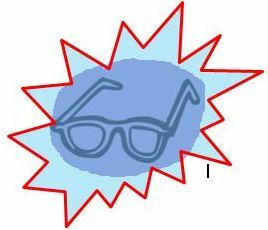 The program is run by experts with the Rutgers Cooperative Extension of Union County, and they will provide you with training and a lesson kit. Don’t delay — to sign up contact Jim Nichnadowicz at the Extension, 908-654-9854 orNichnadowicz@njaes.rutgers.edu or visit ucnj.org/rce. If you love getting your hands dirty, this is the volunteer program for you! No previous horticultural experience is necessary — experts from Rutgers University will train you and certify you as a Master Gardener. 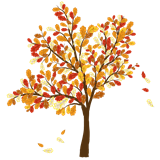 As with the Tree Stewards, a new training course for the Master Gardeners begins each September. The Master Gardeners are one of Union County’s most beloved volunteer organizations and their beneficial touch is felt in neighborhoods everywhere. Among their many projects are thousands of pounds of produce and flower cuttings donated to local food banks and cancer centers from the beautifully tended — and deer proof — Union County Demonstration Garden located by the Trailside Nature & Science Center in Mountainside. 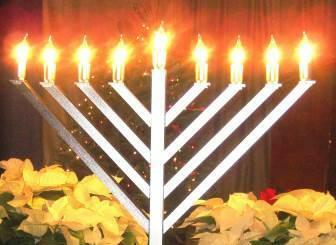 For many more details and information on joining visit ucnj.org/rce or call the Extension office, 908-654-9854. The great American tradition of 4-H youth clubs is alive and well, and living in Union County! From its roots in a 100-year-old program intended to help bring the economic and public health benefits of science to rural communities, in its modern form 4-H enables youngsters to pursue their passion while developing essential life skills including teamwork, organization and public speaking. Archery, Lego Robotics, Cooking, Engineering, Pets, STEM and Fashion are just some of the topics to explore in small groups headed up by local volunteers, and 4-H members can also invent a topic of their own choosing. Union County 4-H runs concurrently with the school year, kicking off in mid-September with an annual Open House where you can meet the club leaders and sign up. For more information and to get on the 4-H mailing list, contact Judi LaGanga at the Extension, 908-654-9854 or jlaganga@ucnj.org, or visit ucnj.org/rce. 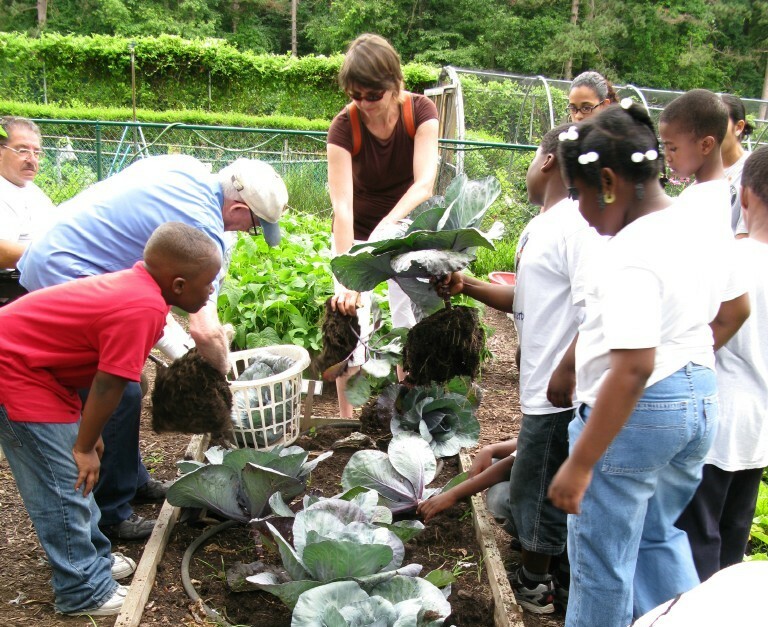 4-H, Master Gardeners and Master Tree Stewards are all supported in part by the Union County Board of Chosen Freeholders through the Rutgers Cooperative Extension of Union County. As the days grow shorter, take a stroll through our Union County parks and fill your senses with the changing colors. Each of our parks has a unique character all its own. Pictured here are scenes from Echo Lake Park in Mountainside, where the 9-11 Memorial provides a setting for quiet reflection. Parks maps and directions: ucnj.org/parks-activities. Cool, crisp fall days are perfect for bike riding, and it just so happens that Union County hosts part of one of the longest bike routes in the country, the East Coast Greenway. 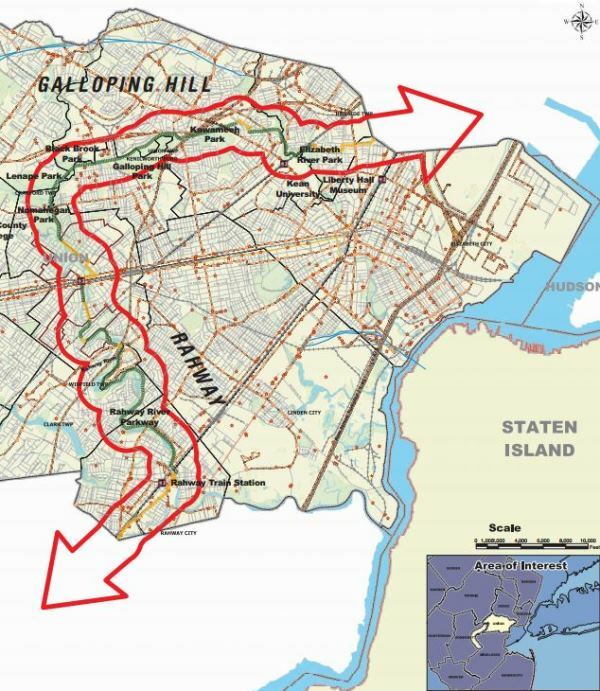 The East Coast Greenway is a national bike route of epic proportions. 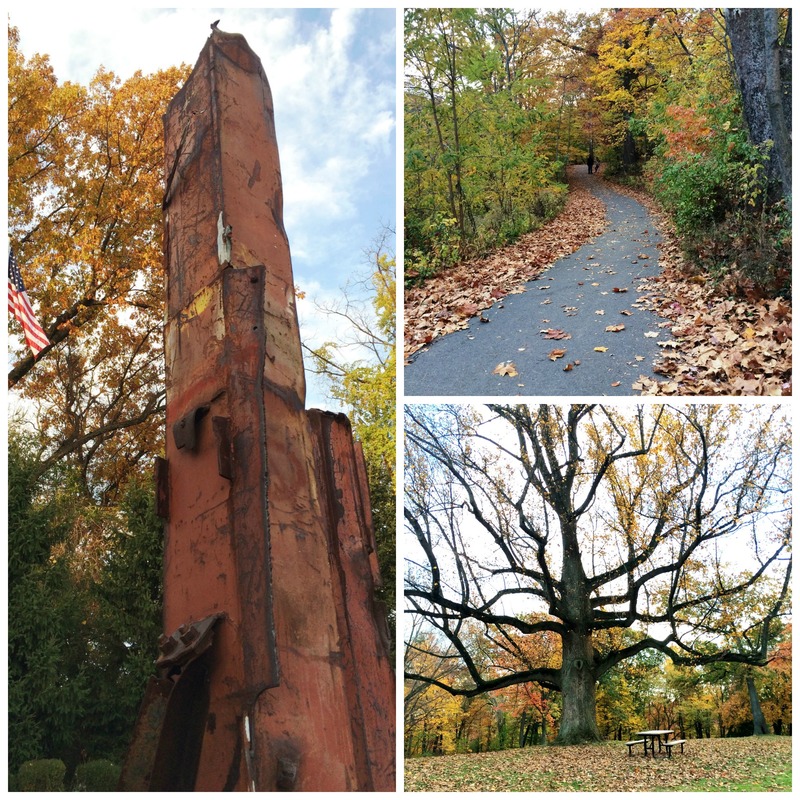 It stretches 2,900 miles from Maine to Florida, and if you’re not up for the whole 2,900 mile journey you can grab a helmet and hit the Lenape Park section for a quick family-friendly jaunt through parts of Cranford, Kenilworth, Springfield and Union. For more details about the East Coast Greenway and all trails and paths in Union County parks visit ucnj.org/parks-recreation. Union County’s popular Sensory Friendly Theatre series just keeps getting better every year. 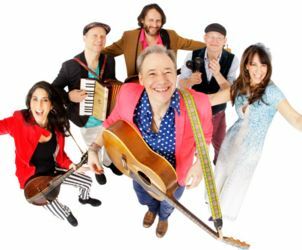 Launched in 2013 by the Freeholder Board, the series provides theatre-goers of all ages with a welcoming, supportive and judgement-free atmosphere in which to enjoy live music, dance, and other kid-friendly performances from top-notch touring talent. 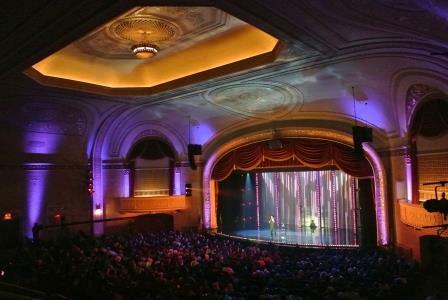 Sensory Friendly Theatre is scheduled periodically throughout the season at the beautifully restored Rahway Theatre, located in the heart of the Rahway Arts District and run by the non-profit Union County Performing Arts Center. For this season’s schedule and ticket information visit ucpac.org or call the box office, 732-499-8226. Every September, Union County’s annual Four Centuries in a Weekend program takes you on a whirlwind self guided tour of Union County’s most popular historic sites, complete with docents in period costumes, entertainment, special events and a time-traveling “passport” for children. 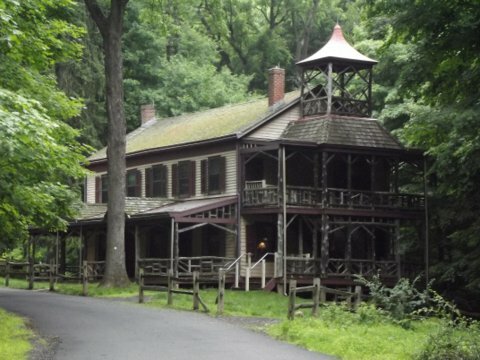 Many of these sites are not open to the public on a regular basis, so be sure to take this once-a-year opportunity to get a glimpse of Union County’s rich history, and literally walk in the footsteps of those who lived it. For dates and information about this year’s Four Centuries in a Weekend tour visit our Office of Cultural and Heritage Affairs online or call 908-558-2550. 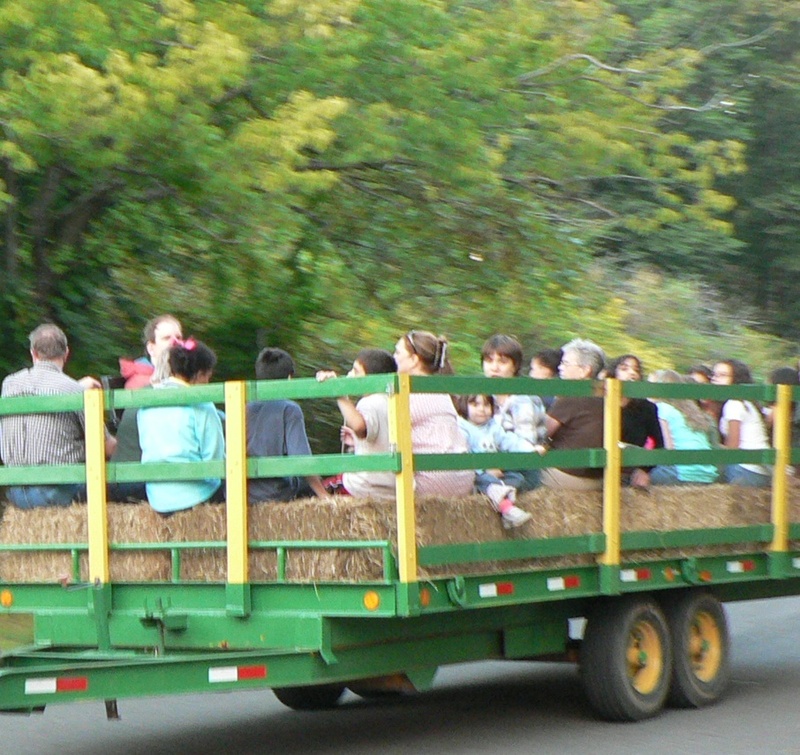 Mid-September kicks off our fall series of hay rides, which continue in October. Take your seat on a bale of hay in our open-air wagon, sit back and enjoy a unique view of our County parks. The rides are scheduled to include daylight sessions in the early evening as well as after-dark jaunts for the adventuresome. Before and after your ride, stay and enjoy old timey music, singalongs, bottomless hot chocolate and infinite marshmallows. We provide the sticks, marshmallows and campfires, you do the roasting. The series sells out quickly and all tickets must be purchased in advance. Follow us on social media so you can place your order as soon as they go on sale. Please note: Only advance tickets are accepted at this event. 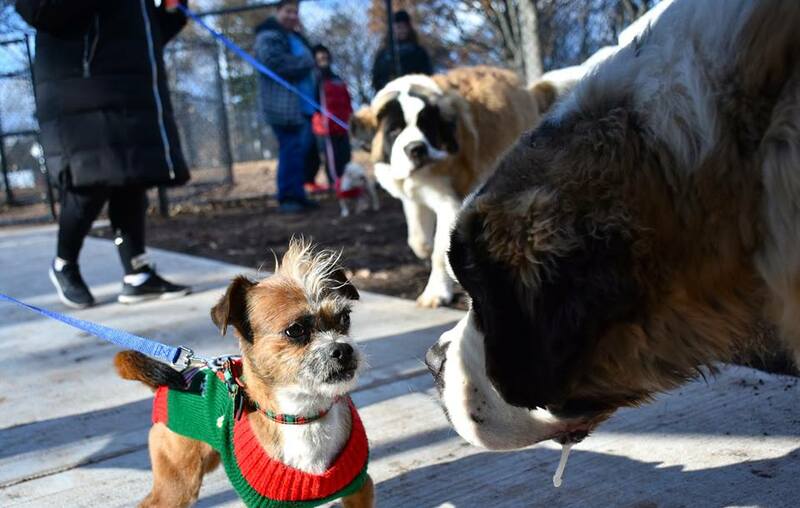 Dog lovers can give their best friends free rein at Union County’s two dog parks. One is located in Echo Lake Park in Mountainside, and the other one just opened in Warinanco Park, in Roselle. The new Warinanco Park Dog Park is located right by the Warinanco Sports Center at One Park Drive. Both dog parks feature large and small dog areas with all the amenities. 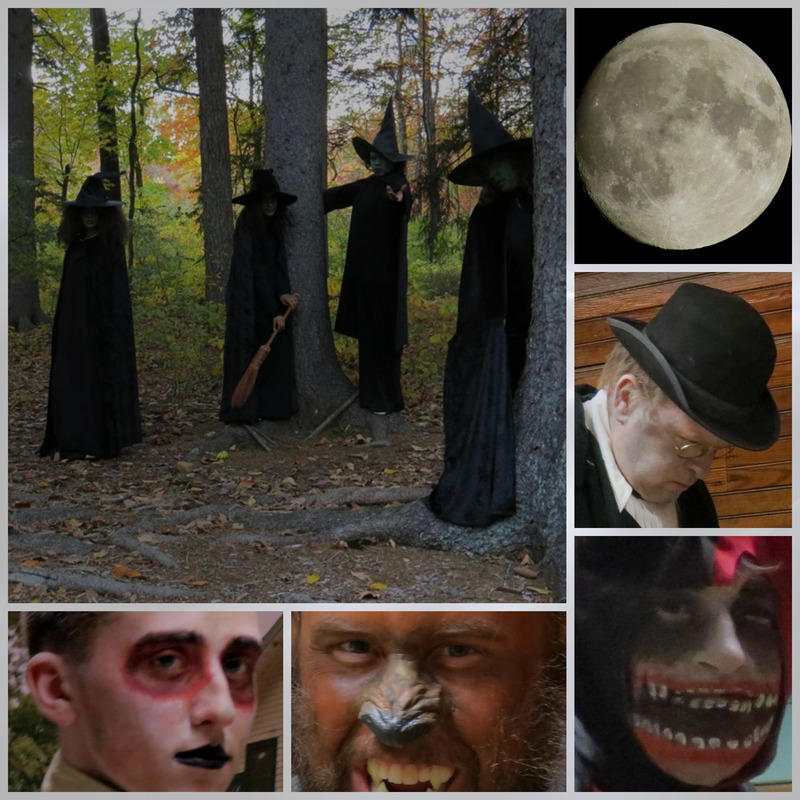 Union County’s own “Haunted Hayride” caps our seasonal fall events, and this is simply not to be missed. Climb aboard our hay wagon for a ride through the Deserted Village of Feltville after dark, where at every turn you will encounter the ghostly presence of former inhabitants and visitors. The ghost of David Felt himself will guide you among the spirits of the past, each of whom portrays an eerie reminder of actual events that took place among the humble wood frame dwellings hidden away deep in the forest. The Haunted Hayride takes place during a three day weekend (Friday, Saturday, and Sunday nights) every year around mid-October. Like our “regular” hayrides and campfires, the Haunted Hayride sells out quickly, and only advance tickets are accepted during the event. Follow us on social media so you can place your order in time. 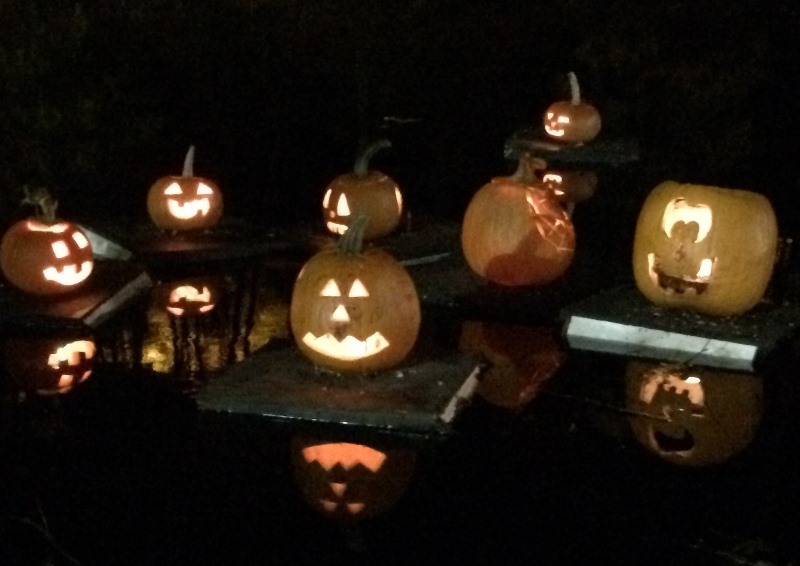 Every year after Halloween, families from all over Union County gather at Echo Lake Park with their Jack O’ Lanterns to bid farewell. As the sun sets, each pumpkin is placed carefully on a float and shoved gently out into the lake, lights blazing, to join hundreds of others in a beautiful display of seasonal cheer. The Great Pumpkin Sail includes all the trimmings including live music with a kid-friendly vibe, fun photo ops, hot chocolate and marshmallow roasting, so plan to linger and enjoy while your pumpkin drifts away. As with our other sellout events, tickets are available only on an advance basis and they go quickly, so keep an eye on our social media to find out when ticket sales begin. Note: all pumpkins are collected for recycling by County staff the day after the event. 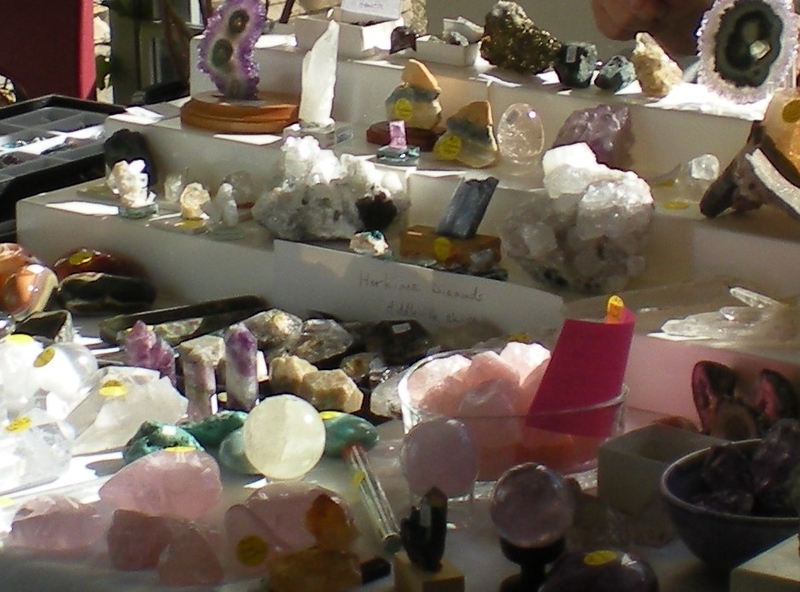 Each November, our Trailside Nature & Science Center hosts the annual Rock, Gem and Jewelry show featuring hundreds of rocks, gems, fossils, minerals, sea shells and jewelry from around the world. Stay and enjoy the regular museum exhibits, too. Trailside is free and open to the public every day, and admission to the show is free, too. Our Warinanco Ice Skating Center is renowned for its memorable family-friendly holiday events. 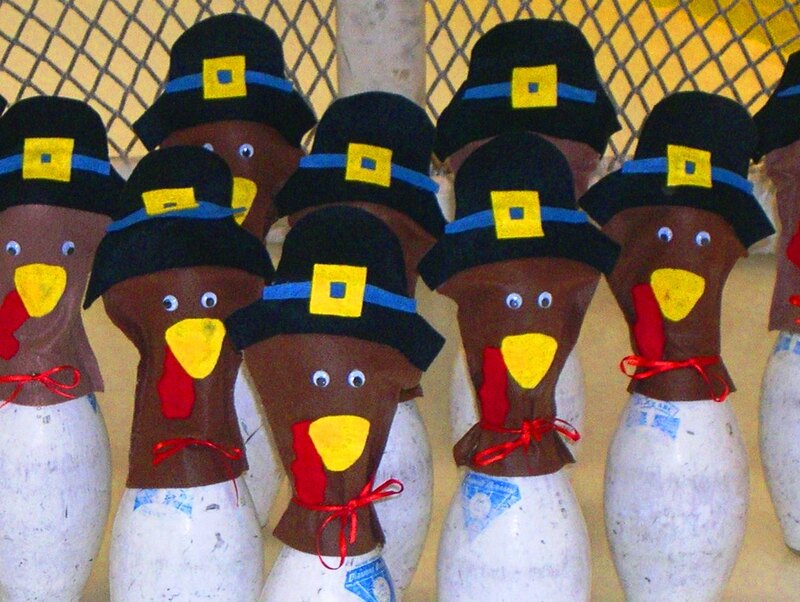 Come join us each November for the annual Turkey Broom Bowl featuring our genuine turkey-themed bowling pins, and come back in December to enjoy a visit with Santa while you take a few turns around the ice. 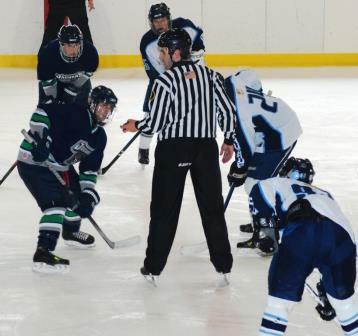 Please note: open skating, holiday events and other special events have been suspended for the 2015-2016 winter season while the Warinanco Ice Skating Center undergoes a complete top-to-bottom renovation and expansion. Every year in December, the Trailside Nature & Science Center in Mountainside hosts the Holiday Nature Craft Show packed with two floors of local and green-themed crafts and goodies to make your holiday gift shopping a snap. Stay as long as you like to enjoy live caroling, a holiday tree lighting and Hannukiah lighting ceremony, and photo ops including a meet and greet with Santa and other costumed characters. 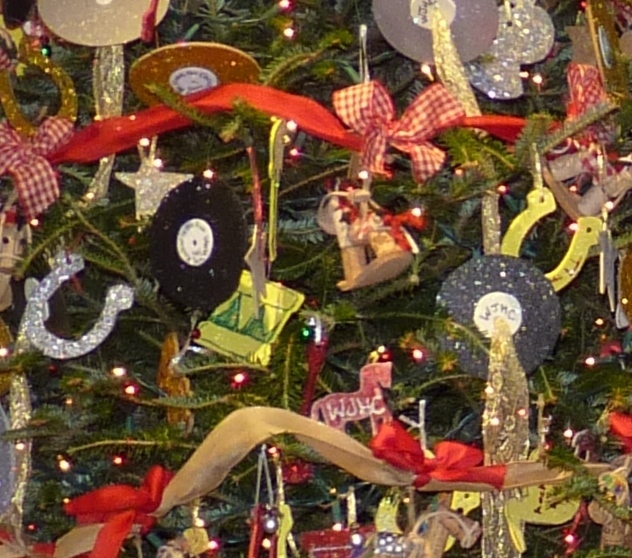 Throughout the show you’ll spot trees uniquely decorated by teams of County staff and volunteers. Families in need will receive the trees, decorations and donated gifts. Don’t forge t to vote for your favorite before you leave — the team with the most votes receives “Best Tree” bragging rights for the whole year! Admission is free with the donation of a non-perishable food item. 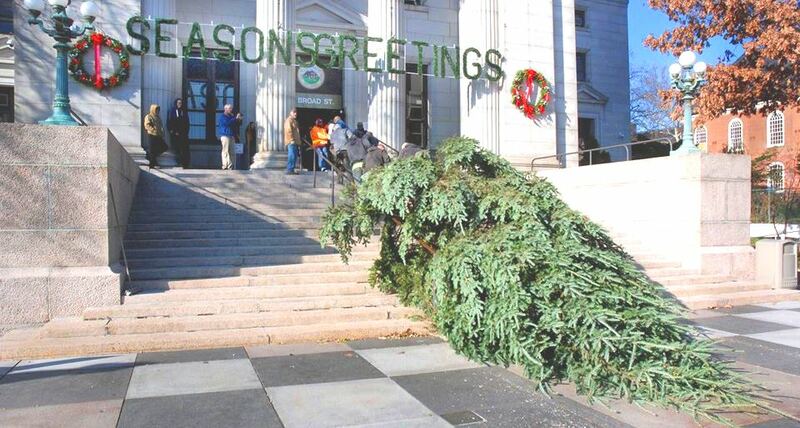 Every year just before the Christmas holiday, the historic Union County Courthouse rotunda is the scene for a traditional tree lighting and holiday singalong featuring an enormous tree donated by a local resident. The Courthouse is conveniently located at 2 Broad Street in the heart of the midtown Elizabeth shopping district, so come and enjoy the festivities while you’re out rounding up last minute gifts and goodies. While you’re in the neighborhood, explore 400 years of midtown Elizabeth history with the “Elizabeth at the Crossroads” self guided walking tour. Follow us on social media for this year’s singalong date and time, or visit ucnj.org. Hundreds of local and community events take place every year in the municipalities that make up Union County, reflecting our rich history and cultural diversity. Check our Cultural Connections calendar to keep up with concerts, theatre, film, art exhibits and many other activities in all 21 towns. Get around Union County by bus, train or bicycle — see our ConneXions page for all travel options.